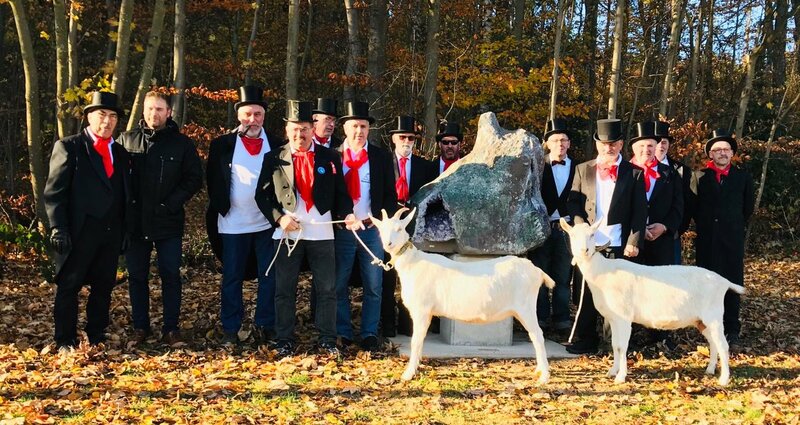 On Saturday, November 17, 2018, the sculpture was officially inaugurated by the mayor of Stipshausen, Mr. Frank Marx, the chairman of the Geißenverein, Mr. Dietmar Schumacher and by myself, in the presence of the goats, Geißenbrüder and friends. 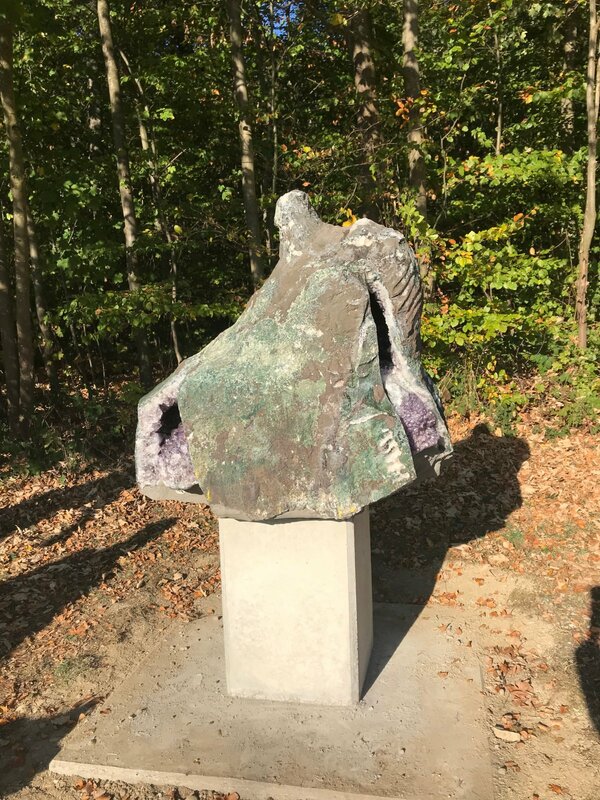 In my speech, I referred to the “unfortunate” test drill of the Brazilians, which ultimately brought us the luck to have such a beautiful amethyst quartz druse as a new object here in the Sculpture Garden. 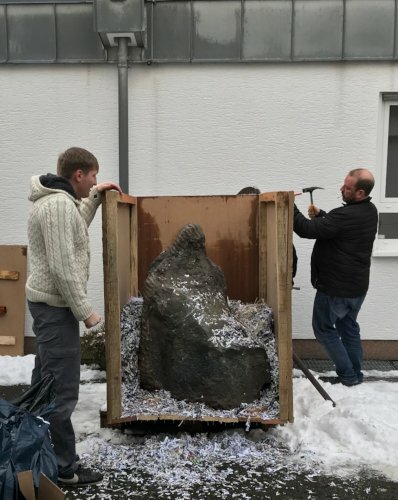 The stone was on the road for a few months until it arrived in Stipshausen on January 10, 2018. 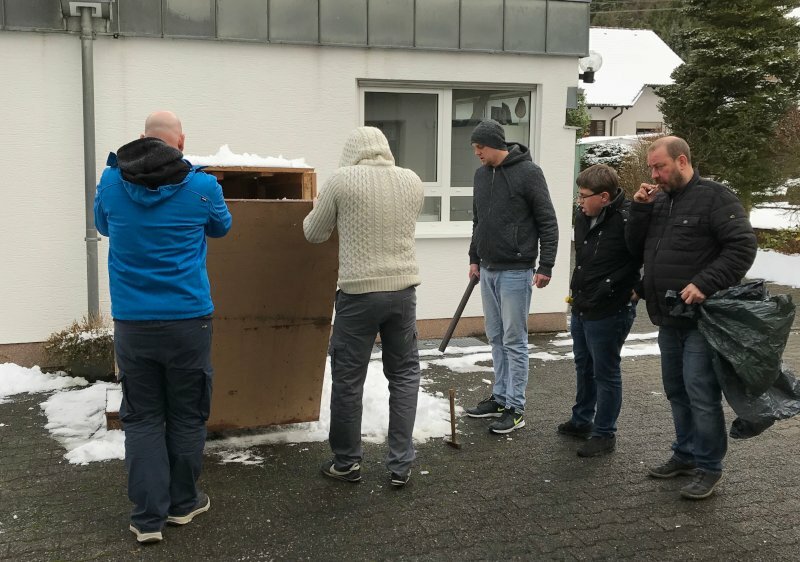 We left the huge wooden box unopened for the time being because of the bad weather, and finally opened on January 18th. 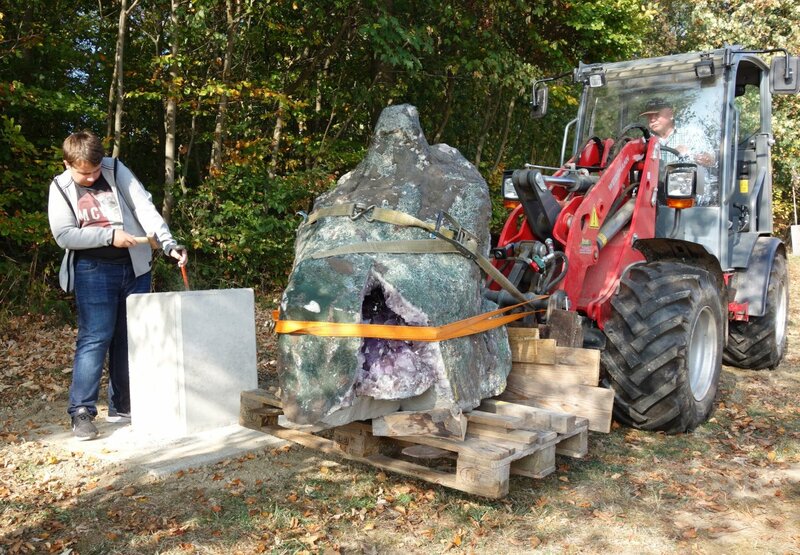 Overall, the unprocessed stone weighed over 800 kilograms. 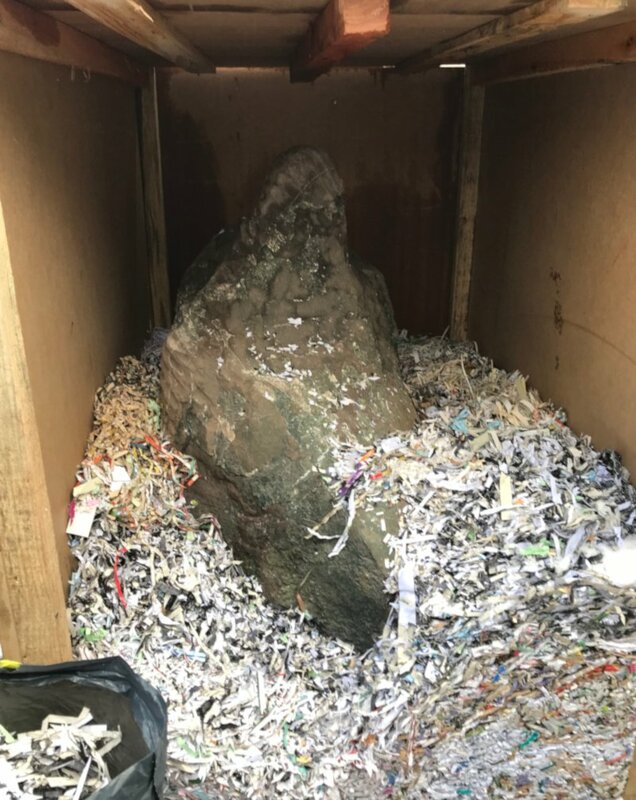 Due to the size and weight of the parcel, the cost of shipping was actually higher than the price of the rough stone itself. I had the first idea for the sculpture three years ago. Back then, I made a request to one of our long-time Brazilian stone traders, Tavares Gems. After two overpriced offers for other, big druses, I decided in 2017 for this “risk stone”. 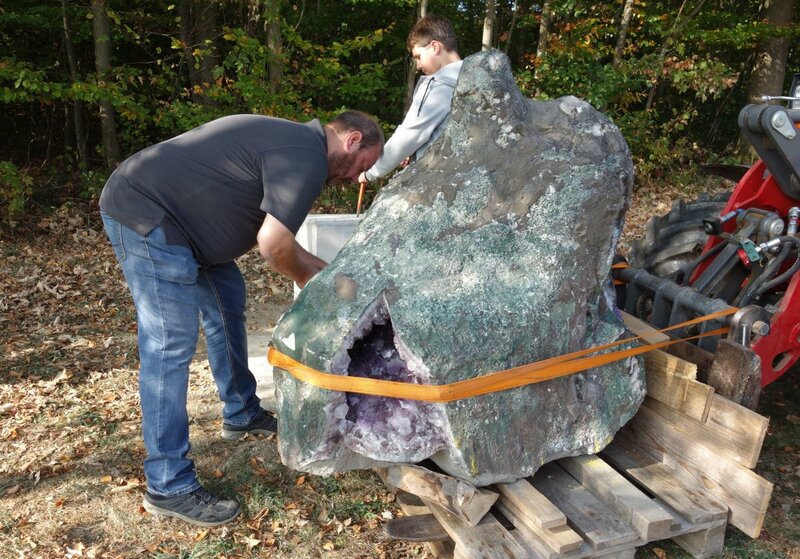 The piece was found in a mine in Rio Grande del Sul in Brazil. 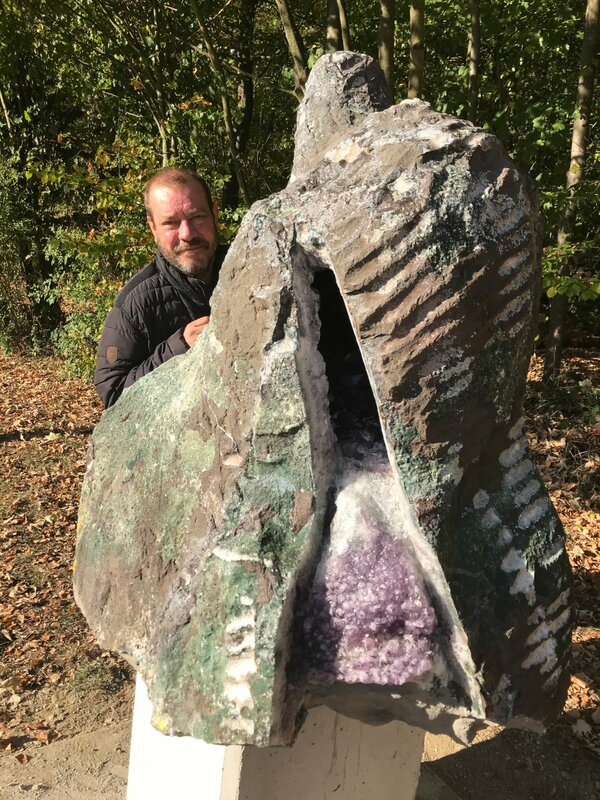 Fortunately for me, the Brazilians had made an error with their test drill into the stone, so they did not fully discover the inside of the druse. 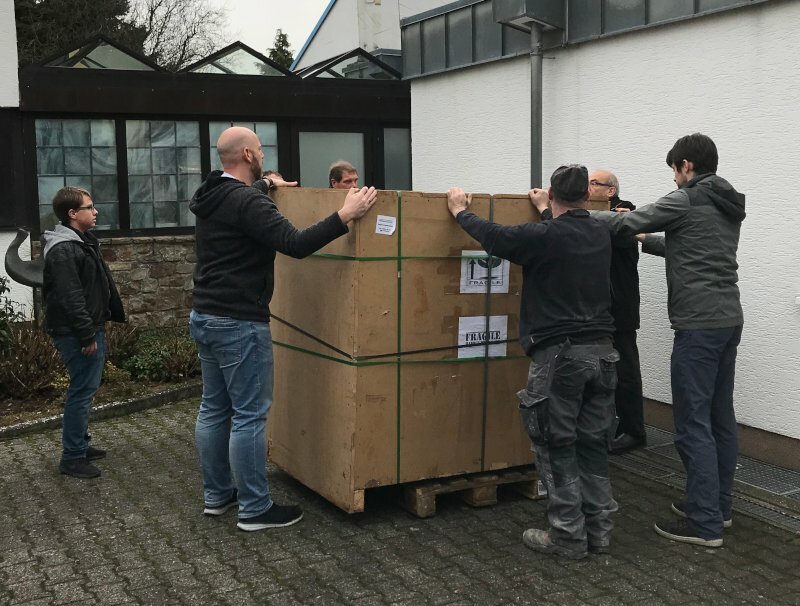 The transport and insurance from Brazil to Germany was organized by Tavares Gems. By sea freight, the druse was transported across the Atlantic. 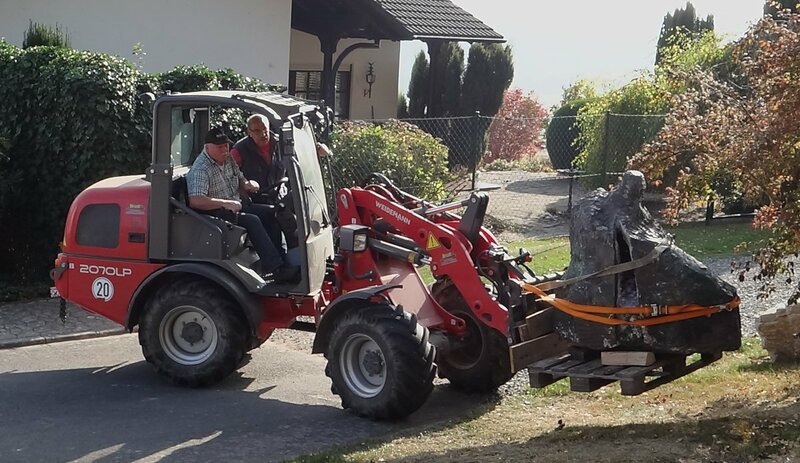 Due to the size and weight of the parcel, the cost of shipping was actually higher than the price of the rough stone itself. 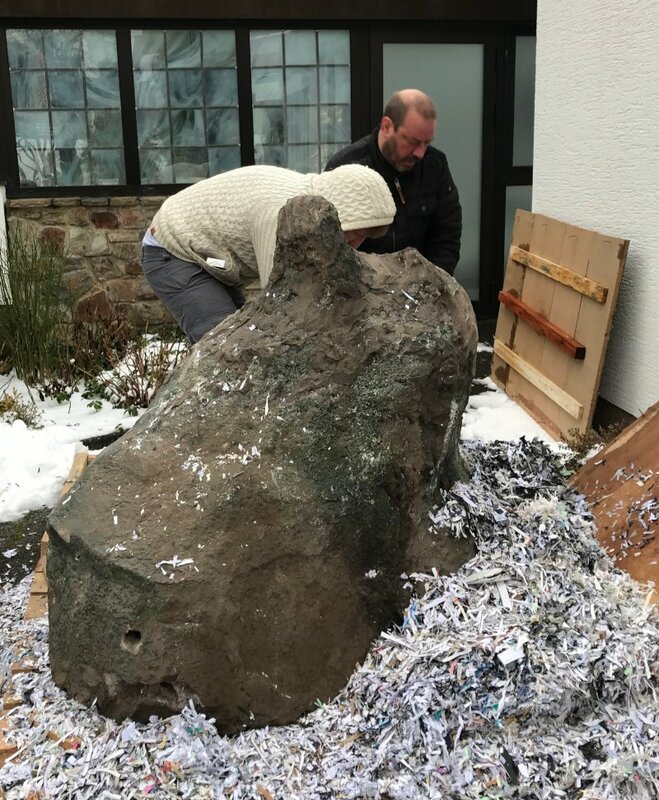 Overall, the unprocessed stone weighed over 800 kilograms. 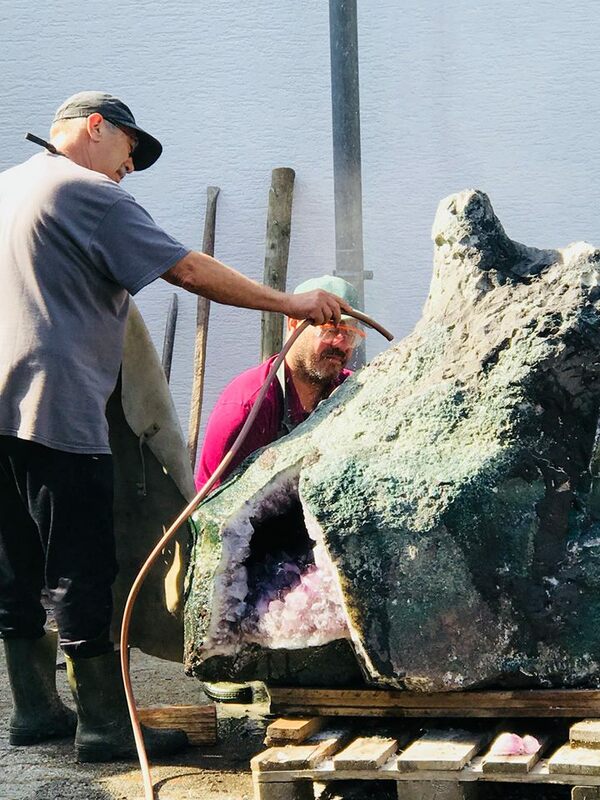 In the following period, we examined the stone closely, located any visible cracks, and together we discussed the best course of action for applying the design. It was only in July that we started with the first cut, which finally gave us a glimpse inside the stone, exceeding our expectations.. In the following months, we continued our work, to further emphasize the beautiful, crystalline interior of the Druse. 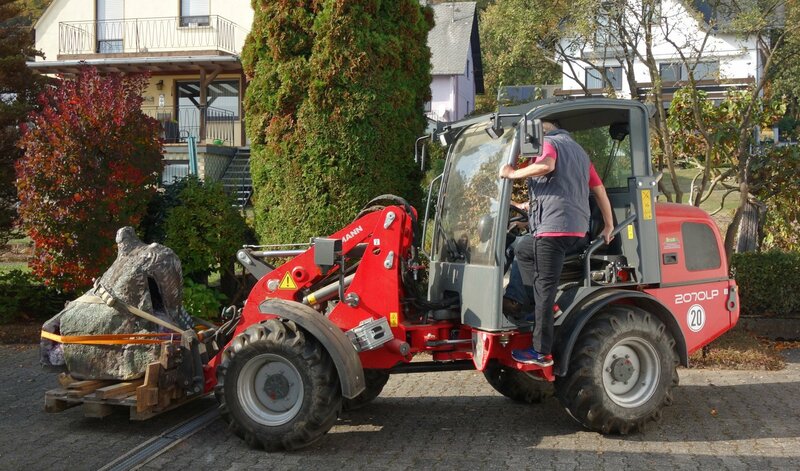 Even Bernd and Philipp assisted the work diligently. 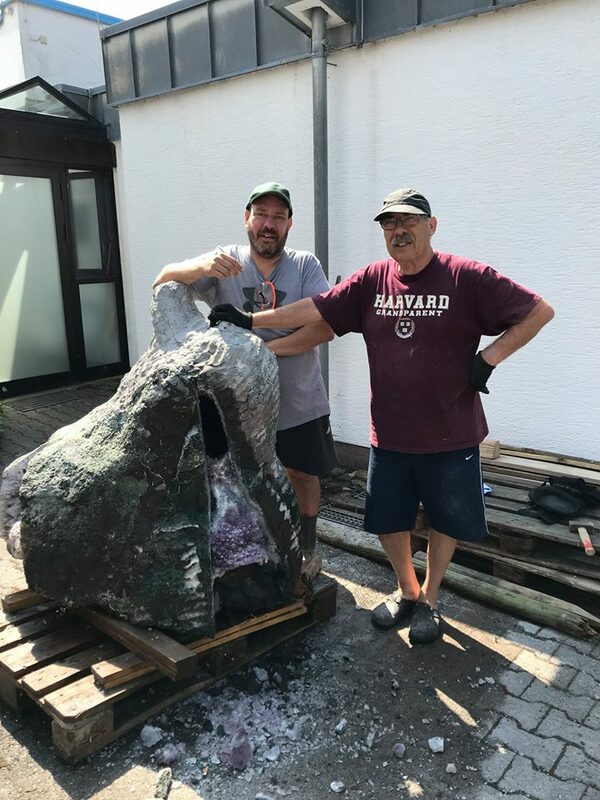 In the beginning of October, the sculpture was finally completed, and we were very satisfied with the result. 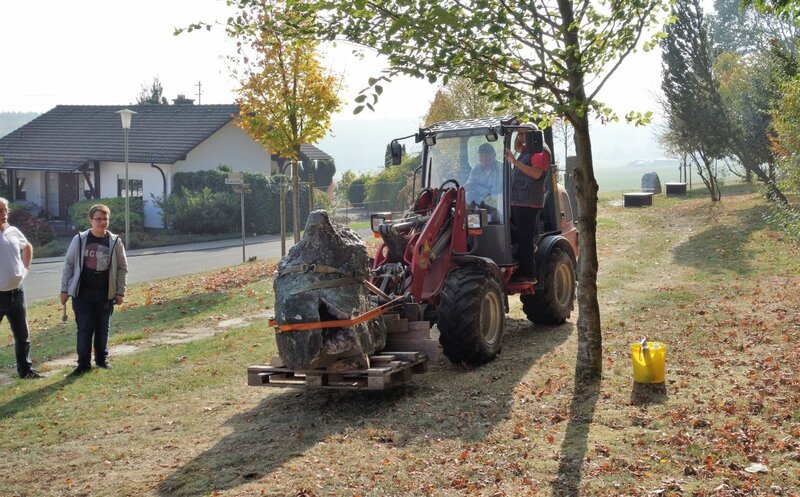 On October 21, the sculpture was transported to the sculpture park with the help of Werner Gerhard (lift truck driver) and Gernot Fritz (coordinator). 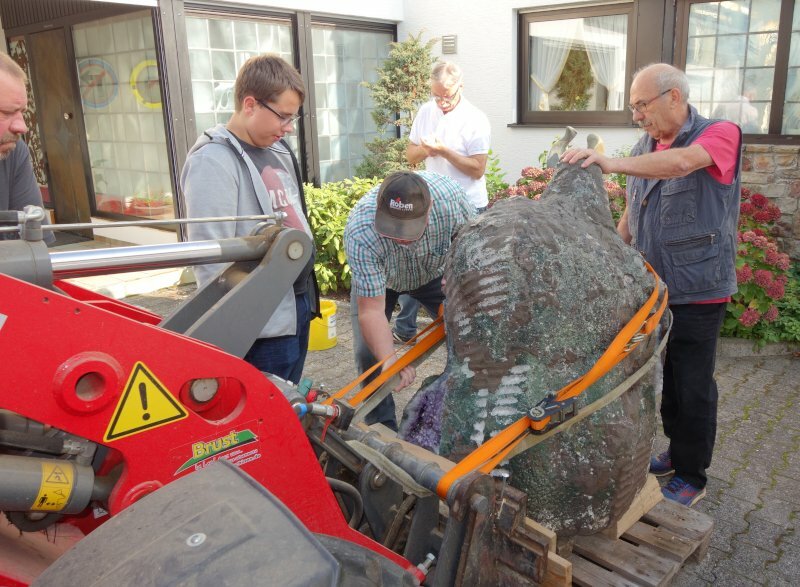 In the new spot for the object, a pedestal with foundation was prepared in advance by the Geissenverein Stipshausen. 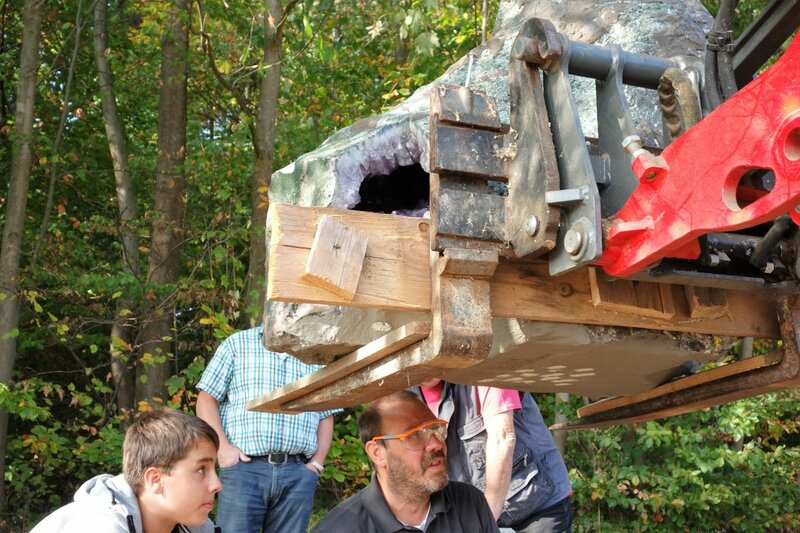 800 kilograms, well secured, with the low loader on the way to the sculpture park. 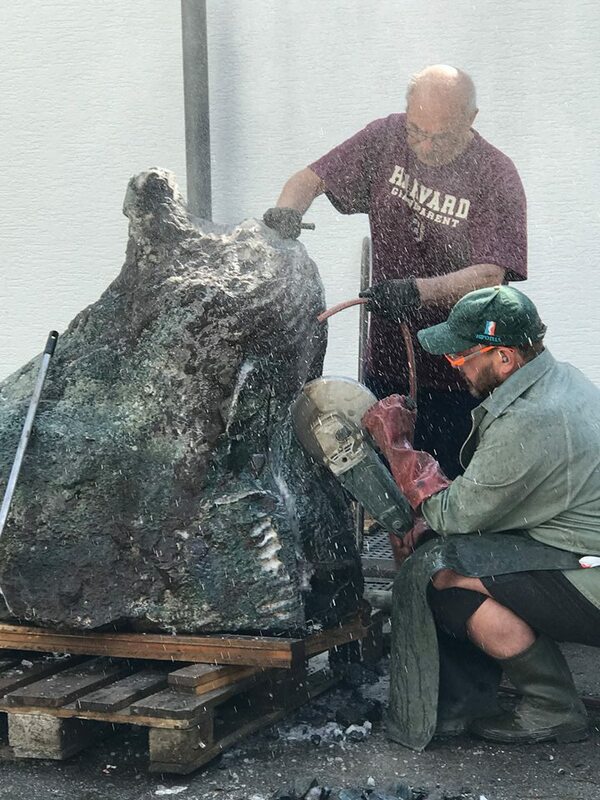 The final steps to place the sculpture onto its pedestal: Closely surveilled and instructed by Tom, the druse was lifted and lowerded onto the concrete base. 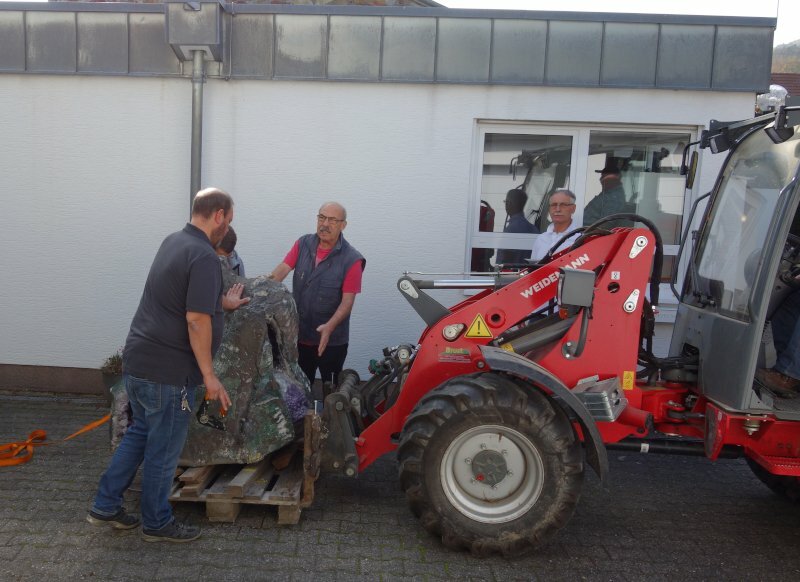 On the right side: Tom, Bernd and Philipp proudly show the finished object, together with our helping hands Werner Gerhard and Gernot Fritz. 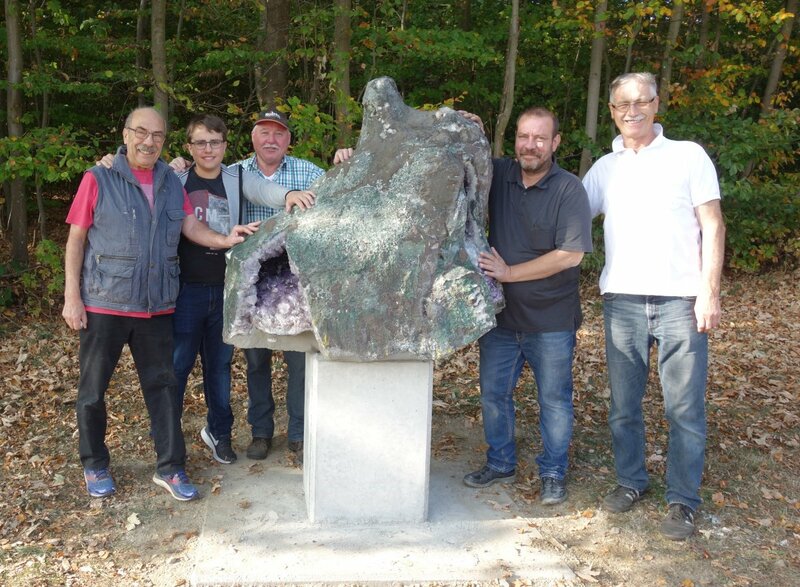 The sculpture bears the name “Vater-Gestein” (Father Rock), and is a tribute to my father Bernd, both as an initiator and as a pioneer of the sculpture park. 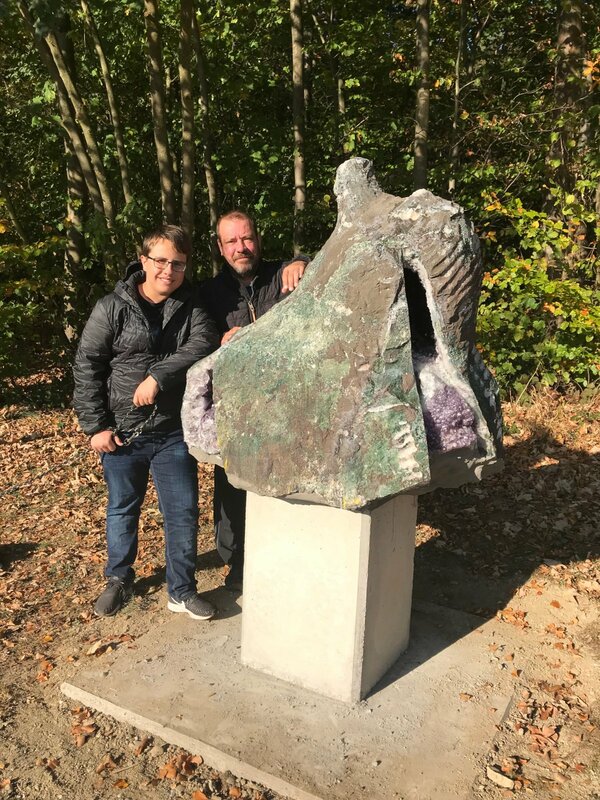 The three incisions in the sculpture symbolize the insight that Bernd has given me in the practice of my gemstone cutting profession over many years. At the same time, it is an insight into the depth of the natural gemstone.